Some people use a sheep halter only when exhibiting their animals, but teaching your sheep to lead can come in handy for many other purposes. Halter-training a sheep takes some time, so give yourself plenty of it. Halter-training should include tying as well as leading, especially if you intend to show. Before attempting to halter a sheep, you must gain the animal's trust. For best results, start shortly after a lamb is weaned. Spend time with the lamb, feeding her and speaking softly and petting her while she eats. Many lambs are skittish, so it could take time for her to trust you. Soon, she should look forward to seeing you -- and getting her meal -- while you scratch her gently. Once you can handle her freely, you can try halter-breaking her. You can purchase a rope or nylon sheep halter, or you can make one yourself. Clemson University Extension recommends using a rope that's a minimum of 10 feet long and three-eighths-inch or a half-inch in diameter. Make two loops for the nose piece, at a length of 7 inches. Sew or otherwise firmly fasten the two spots where the ropes touch. By pulling the loose end of the rope through the two fortified loops, you've created a halter. Basically, the nose piece encircles the nose, with the excess rope going through one loop, around the head, through the other loop and the remaining length of rope acting as a lead. Put the halter on the lamb so you are standing on the left side with the lead rope. The nose piece should fall equidistant between the mouth and eyes. Expect your animal to freak out the first time she's haltered. Let her calm down, remove the halter, then repeat the action the next day. Stay calm yourself, so the lamb can sense there's nothing to fear. Within a few days, she should be just fine about haltering. Once your lamb is comfortable with the halter, try tying her to a stationary object. That means a wall, a fixed beam or something solid that she can't pull down. Avoid tying her to a fence unless you're certain it won't give. Leave your lamb tied, but stay in the vicinity. Some sheep struggle, while others quickly figure out they must give in to the rope's pressure. 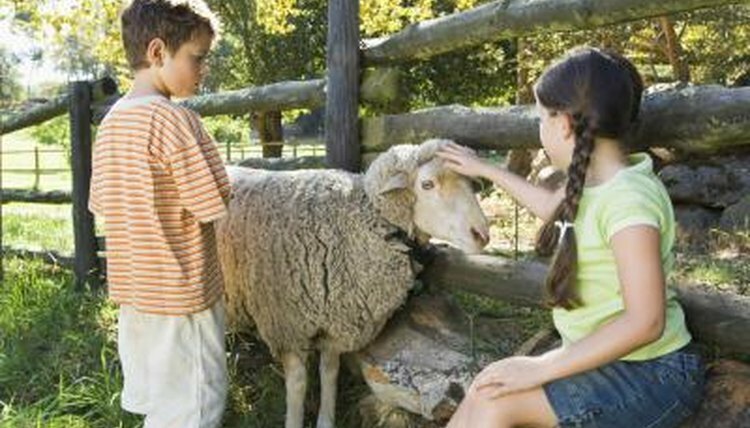 You can brush or pet your sheep once she's calm. Tie her every day, starting at 10 minutes the first day and working up to about half an hour. Never leave her tied and unattended. When leading, make sure you don't wrap the rope around your hand. A sudden start from the sheep could cause you serious injury. You should be on the left side of the lamb, holding the halter/lead in your right hand. Start out with steady pressure on the lead. The second the sheep starts moving, release pressure so some slack is on the lead rope. Keep repeating the pressure and release, and soon the sheep will figure out that pressure means "go forward." Make these first sessions short, always ending on a good note. Within a few days, the sheep should learn that she walks when you walk and stops when you stop. What Is a Club Calf?